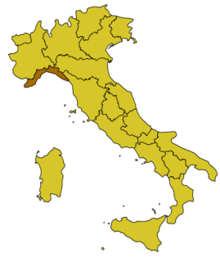 Liguria is a coastal region of north-western Italy with a population of 1.615.441 inhabitants. This region is situated between the Ligurian SeaAlps and the Apennines mountains. It is a winding arched extension from Ventimiglia to La Spezia and is one of the smallest regions in Italy. Natural parks: 1 national park (Cinque Terre National Park), 9 regional parks and 3 natural reserves.